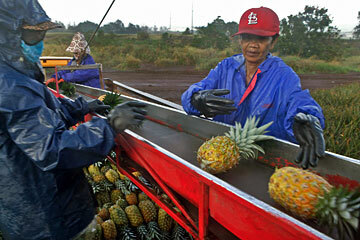 Del Monte fieldworkers sort pineapples on a conveyor belt in Kunia. Del Monte Fresh Produce Hawaii Inc. announced yesterday it will pull out of the islands within two months instead of waiting for its current crops of pineapple in Central Oahu to mature in 2008. The news was abrupt and astonishing to the hundreds of workers at Del Monte, as well as its Oahu landlord, the Estate of James Campbell. When Del Monte announced plans in February to pull out of Hawaii after 100 years in the state, the company had said it would continue harvesting and packing pineapples until the fruition of the current crops' three-year cycle. But in a notice issued yesterday, Del Monte said it would cease all production, operations and shipments out of Hawaii, effective immediately. Del Monte also informed the International Longshore and Warehouse Union Local 142 that 551 employees would be laid off around Jan. 22. The company is required to give 60 days' notice of the layoffs by federal labor law. "This extreme drop in production volume, coupled with depressed pineapple pricing resulting from the increase of supply in the overall pineapple market, has had a negative financial impact on the company," Del Monte said. 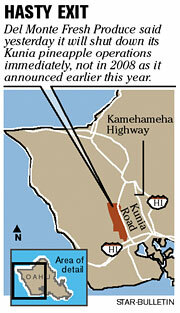 "As a result, the company regretfully will not be able to sustain a financially viable operation in Hawaii as originally planned through 2008." Company representatives could not be reached for interviews. The ILWU called the announcement a "huge blow" to its workers and also "cruel," given that the holidays are approaching. Some 125 families who live at Kunia Camp, operated by Del Monte on Campbell Estate lands, are left with uncertainty over whether they will keep a roof over their heads, the union said. "All of them believed the company's repeated assurances that operations in Hawaii would continue into 2008," the ILWU said in a press release. In February, Del Monte announced it would stop planting pineapple in Kunia but said it would take three years to phase out other parts of its operations. But the union said yesterday it has seen the operations go downhill recently. In late September, Del Monte's Hawaii general manager, Edward Littleton, left the state and turned over the reins to Human Resources Director Stacie Sasagawa, who had little experience in running a pineapple plantation, the union said. "This company (Del Monte) has been less than honest with us from the start," ILWU President Fred Galdones said. "Unlike locally owned companies under similar circumstances, Del Monte has consistently refused to provide any additional benefits to help the workers through the layoff. With no ties to Hawaii, Del Monte has exploited the employees and the community and really doesn't care how they leave Hawaii." The statement also accuses Del Monte of taking the know-how it gained from Hawaii workers and using it to produce pineapple elsewhere in the world with lower labor costs and standards. The Campbell Estate, which leases 5,100 acres to Del Monte, said it was caught off guard by the agriculture company's announcement yesterday. Del Monte still has a lease with Campbell that runs through 2008, the estate said. "We weren't expecting it," estate spokeswoman Theresia McMurdo said. Since Del Monte's original announcement in February, Campbell Estate has been marketing the land for sale through real estate firm CB Richard Ellis Hawaii as nine separate parcels. Meanwhile, U.S. Sen. Daniel Akaka said he was saddened and disappointed by Del Monte's decision to close its doors early. "I am concerned about the impact this loss will have on families that make their livelihoods in the fields of Del Monte," Akaka said yesterday. "I am committed to working with our congressional team to somehow soften the impact that this will have." Del Monte's exit might have more to do with the company's financial problems than with the state of pineapple agriculture in Hawaii, although the latter is also waning. The Coral Gables, Fla.-based company reported a third straight quarterly loss in October, due to lower fresh-produce sales. Del Monte financial statements cite inefficiencies in Hawaii associated with employee turnover, reductions in volume and a decline in pineapple market prices. The company reported $1.5 million in charges and $2.7 million in noncash charges for one-time termination benefits and contract termination costs in Hawaii in the latest quarter. "If a product isn't profitable, we won't produce it or procure it," Del Monte CEO Mohammad Abu-Ghazaleh said in an October conference call. In 2005 there were 14,000 acres of pineapple harvested in Hawaii, yielding 212,000 tons of fresh and processed pineapple, according to U.S. Department of Agriculture statistics. That reflected a decline from a year earlier, when 13,000 acres produced 220,000 tons of pineapple. Fresh market pineapples in Hawaii sold for about $600 per ton in 2005, according to the department, down from $634 in 2004 and $626 in 2001. "Pineapple is still a very important crop for Hawaii," said Sandra Lee Kunimoto, chairwoman of the Hawaii Board of Agriculture. Del Monte's exit leaves Maui Pineapple Co. and Dole Food Co. Hawaii as the only remaining pineapple growers in the state. Maui Pineapple Co. says it is ready to step in and save Del Monte Fresh Produce's current pineapple crop in Kunia. "Because of our unique ability to process canned pineapple, we stand ready, willing and able to step in right away to salvage the pineapple crop that Del Monte is apparently leaving behind with its abrupt departure," said Brian Nishida, president and CEO of Maui Pineapple. "We are willing to work with the landowners and the ILWU to the extent possible." When Del Monte exited Poamoho fields on Oahu in 2004, Maui Pineapple was able to keep the area active in agriculture for another year, providing jobs and stewardship of the agricultural lands, Nishida said. Nishida said Maui Pineapple wants to do the same again, and also would be open to offers from Del Monte to take over operations completely, but it would first have to evaluate conditions and terms. Parent company Maui Land & Pineapple Co. produces and markets Maui-grown pineapple and operates the Kapalua Resort in West Maui.